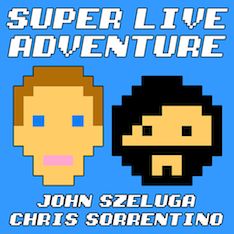 John Szeluga Comedy: Super Live Adventure Podcast Recording! 8:30 PM free show on Tuesday, May 21st at Full Cup, 388 Van Duzer Street, Staten Island, NY. John Szeluga and Chris Sorrentino will be sitting down with Manny Rondon of Far Fetched Comedy, plus Laura Williams of the Wahoo Skiffle Crazies will be returning to read letters from an angry 14-year-old bully. To listen to past episodes, look for Super Live Adventure on iTunes and Stitcher. Send us a message on Facebook or Twitter to tell us what you think of the show!